Hori Real Arcade Pro 3 SE (PS3) | SDTEKKEN.COM - TEKKEN News Resource! This is 100% not the same stick in the Tekken bundle. The Tekken Bundle has a tekken logo on it. Hey Mark, do you know when this will be available to us like via through Play-asia or another way? It will be available on Play-Asia soon… you can subscribe to their email list and have them email you when it will be available. Keep checking this link here. what’s the difference between this and the normal one? This one is equipped with Seimitsu parts. While similar to the current HRAP3’s Sanwa JLF stick, they are completely different beasts. The main difference is ‘different’ parts. Also no stock Hori buttons. It’s all SEimitsu. This one will most likely have the traditional/universal mounting bracket. What is your personal experience with Seimitsu and how would you compare it to Sanwa? I’ve got a custom-made Sanwa stick, thinking about buying seimitsu as well. Do all Seimitsu sticks come w/a 4-way or an 8-way? 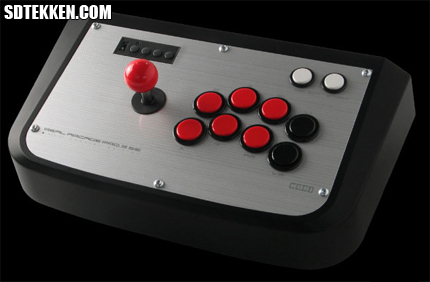 I have an SF4 TE but I’m debating between this & the HRAP 3 SA to have as an extra joystick. Thx! By approving our comment, we’ll provide $0.01 to a unique cause. I think tgis is one of the most vital info for me.